The Mal-Shi is not a purebred dog. It is a cross between the Maltese and the Shih Tzu. The best way to determine the temperament of a mixed breed is to look up all breeds in the cross and know you can get any combination of any of the characteristics found in either breed. Not all of these designer hybrid dogs being bred are 50% purebred to 50% purebred. It is very common for breeders to breed multi-generation crosses. Kona the Mal-Shi as a puppy at 4 months old—"This is our pup Kona. She is a daddy's girl but sweet and playful with everyone. She likes to pretend she is a cat." "We found Braeden in an online ad; he was needing a home ASAP. It's his THIRD home. The previous owner had him for a month. He was 16 weeks old and he had no name, no collar, low contact with other dogs or people. He had Giardia, ear infections, underweight, and fleas...he was perfect! "He looked drunk and Irish...so I took one look at him and said " you look like a Braeden." It's taken a long time for Braeden to attach and trust. He's still learning how to play with other puppies. Now at 7 months he's more willing to sit on my lap for a few more minutes. Loves to play fetch and loves a good stick, meeting new people and new dogs. "At eight months, Braeden weighs 10.4 lbs., is 17" long and 10" tall at the shoulder. Braeden has characteristics of a Shih Tzu: tri-olor hair, tipped ears, longer body and that cute hair above his nose that points up. From the Maltese, Braeden got straighter thin hair, a longer nose and no under-bite common to many Shih Tzus. His nose seems larger than a Maltese. He can be very fluffy and gets compliments on his hair almost every day. However, owning a Mal-Shi without the "puppy cut" is a commitment to grooming. Braeden is brushed in the morning and before bedtime. Sometimes an extra session is needed to gently work on knots that easily occur on his underside. When brushed every day, he's never gotten matted. You just have to keep up with it. He gets a daily dose of Angels Eyes to keep tear stains, which are very common to both the Shih Tzu and the Maltese. "His temperament is more like the Shih Tzu. He's a hearty player with other dogs. He loves to run and wrestle energetically with other Shi Tzus. He's not a lap dog. He loves meeting new dogs and especially loves to meet new people. Like most breeds, it's very important that he gets exercise, both physical and mental. He was easy to potty train using potty pads. But he quickly transitioned to going outside. If he has an accident it's between 7-9pm where I haven't watched how much water he drank at dinner and in the evening. He's been quick to learn to sit, stay, lie down, shake, fetch, leave it and drop it." 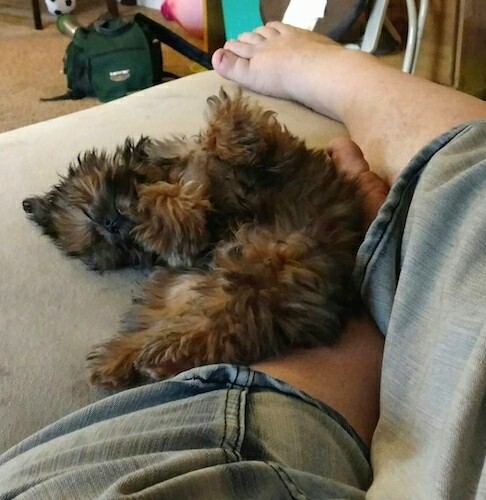 "This is Chewy, our Mal-Shi at 5 months old. Chewy is very sweet and playful. His hair grows fast and he is somewhat difficult to potty train, but he is such a sweetie. A little timid, but loves to have his belly rubbed!" Malshi puppies (Maltese x Shih-Tzu mix)—Rocky weighing 2 pounds (seven weeks) and Muffy weighing four pounds (four months). "Jaxon is a Maltese / Shih Tzu hybrid dog. He is age 4½ months in this photo. He loves attention and people, chewing on carpets, kissing his favorite cat (Bella), short walks and treats. 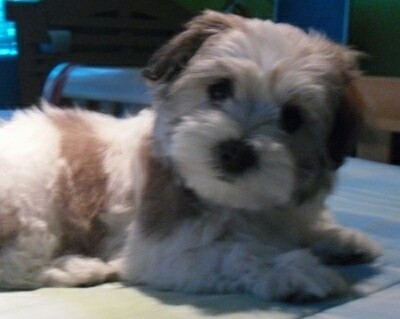 He is very outgoing and friendly to everyone and his mommy says he has more of a Shih Tzu temperament than a Maltese." 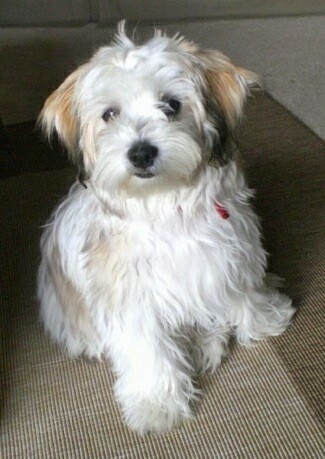 Rocca the white Mal-Shi at 7 months old—"Rocca's mother was a Maltese and her father was a Shih Tzu. I was notified after she was born and I went to see the litter. As soon as I saw her I knew she was the one for me. I picked her up as soon as she was weaned from her mother"
Jimmy the Mal-Shih puppy (Maltese / Shih Tzu) at 15 weeks old—"The newest member of our family who is so cuddly and loving." Chuchi, the Mal-Shi (Maltese / Shih Tzu mix) at 2 months old and 4 pounds—Chuchi's owner says she gained 4 more pounds over the next 7 months (for a total of 8 pounds). 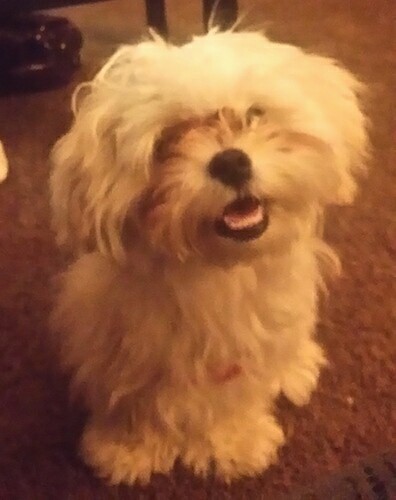 "Sofie is a Mal-Shi (Maltese / Shi Tzu mix). She is approximately 10 months and 8 lbs. in this picture." "Sofie is a Mal-Shi (Maltese /Shi Tzu mix). She is 8 months old and approximately 6 lbs. in this picture."